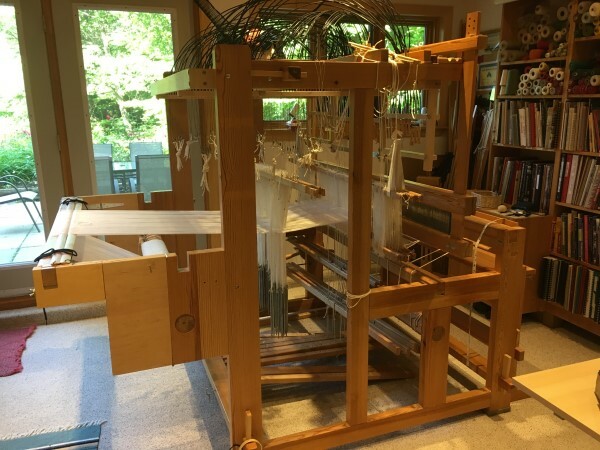 This is the process of modifying a pre-Myrehed Glimakra Drawloom using the triangular method of pulling up the pattern shafts to a direct vertical draw using contained motion cables. This came about because the triangular method of drawing never gave a clear shed, nor a large shed. 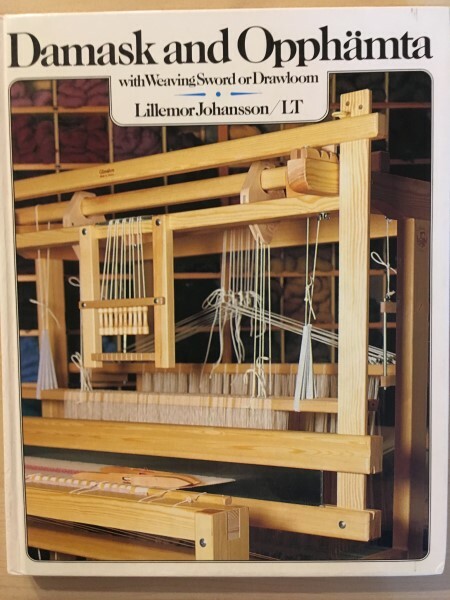 Image: front cover of Lillemor’s book. 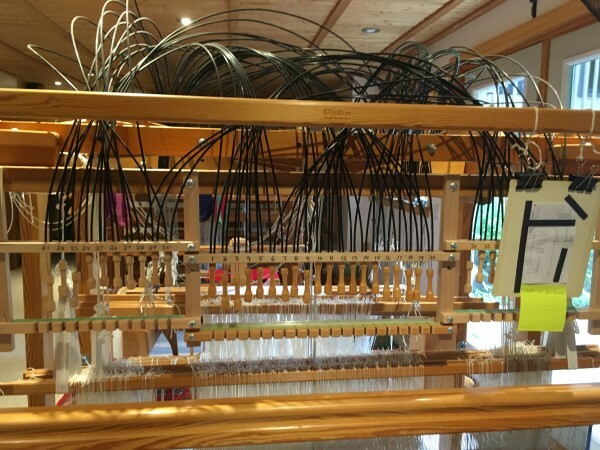 This reminds us what the loom looked like before the conversion. Having both an Oxaback, which uses a floating lamms and direct side draw method as well as the Glimakra that used the center pull triangle method, it was obvious that the direct pull from both sides of the shafts worked much better. Through several modifications made by both of us individually, we were able to obtain a straight parallel side pull on the Glimakra using the principles of the Oxaback. These initial modifications were written up in the International Damask Newsletters Winter 2011 (Kay) and Fall 2012 (Jette). After these modifications, Jette’s engineering husband got involved and Medusa was produced. His aim was to achieve a perfectly parallel horizontal lift with contained motion. 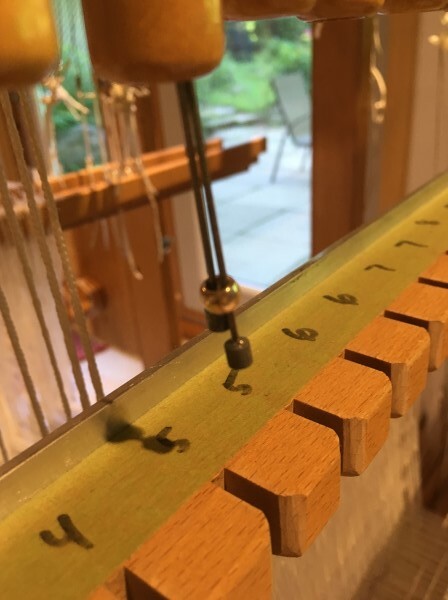 Whatever the pull with the handle at the front of the loom would equal the lift of the shafts at the back and with greatly reduced friction. He saw the existing contact points of where texsolv cord touched and changed direction as points of accumulated friction and recognized that texsolv would wear and that the eyes in the cord allowed stretch. The Medusa method of drawing far superceded the previous attempts as the draw shed is larger and cleaner and most importantly, pulls much lighter. Hence there is less effort required as the result of less friction on any moving parts. Texsolv cords were replaced by internally Teflon coated outer cable (bought in bulk) and ready to use derailleur cable (with a stop on one end. The other end will be trimmed to suit each position). 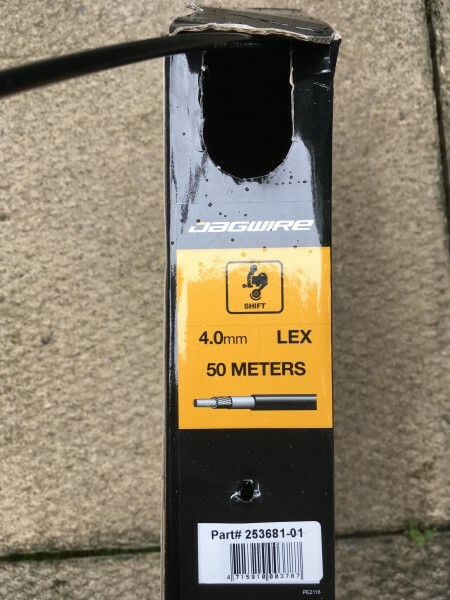 Image of box of bulk outer cable. The inner cables were purchased from a bike shop, with what can only be imagined as an interesting conversation. The original Texsolv cords used for pulls were removed along with all existing structure. New comber boards were drilled, one for each side. There are two comber boards, one on either side. Each has the requisite number of holes for the total number of pattern shafts. These comber boards are positioned directly above where the shafts are pulled up vertically (no angled pulls and each shaft is directly below its hole). The inner part of the cable passes through the drilled hole. The outer part of the cable rests or is embedded on top of the comber board, giving it stability. 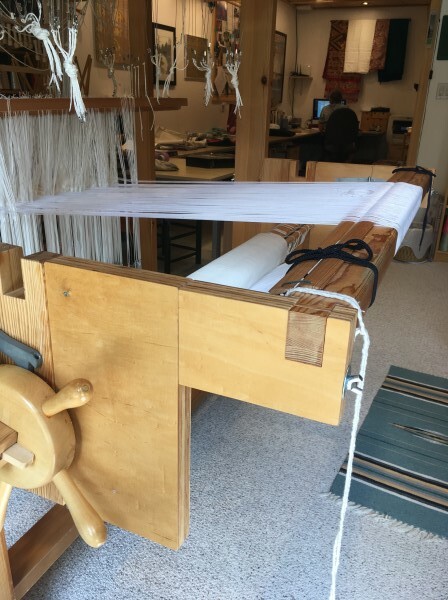 Image: Comber boards on both sides of the loom viewed from above. 20 holes for 20 shafts. Once through the hole, the required length is 8” or 20.5 cm to the end of the cable where it is looped. Into the loop a piece of Texsolv was inserted to allow for smaller adjustments to the shed height. Image: Loops on the end of the cable showing short lengths of Texsolv to attach the shafts. This allows for minor adjustment. 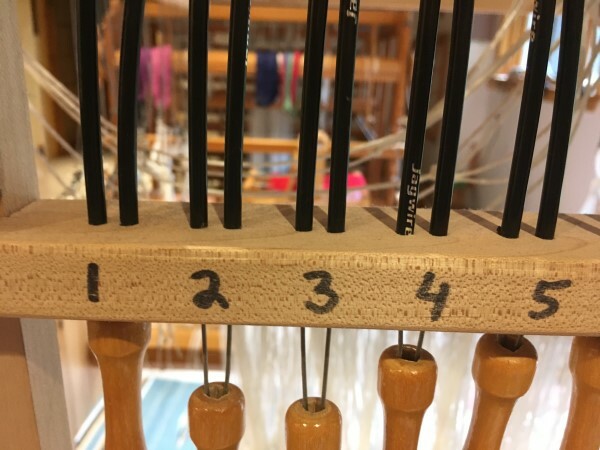 The Texsolv is then attached to the pattern shaft using the pre-existing hooks. Image: Opened hooks or eyelets hook into the other end of Texsolv cord. The cables, in their sheaths, were looped over the top of the loom. There are two cables, one to each side. These cables could not be folded or kinked and hence formed a curved pattern above the loom (and the name Medusa was obvious). 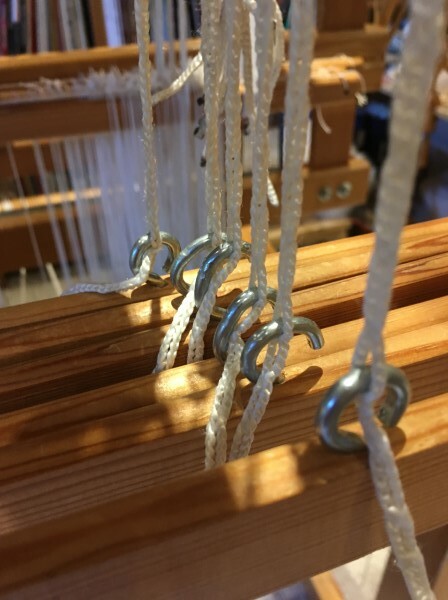 Image: As the cables cannot be kinked, they form a natural curve above the loom. The cable ends were attached through the pull handles using the original end stop from the bike cable and a small bead to anchor both together. Image: Two cables, one from each side of the comber boards require two holes. Image: The two cables with an end bead will sit back inside the original pulleys. 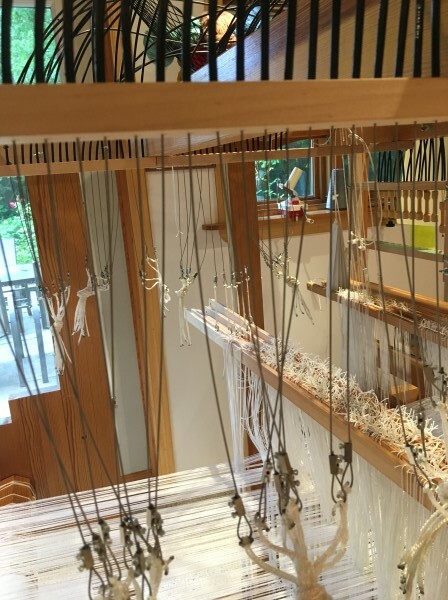 The result is a loom which pulls each shaft horizontally, evenly, cleanly and equally functional on all sheds, a win-win situation which makes for happy drawloomers! In addition, we were both very happy to have Harry suggest the addition of an additional 20 shafts! Glimmy grew up to have not 20, but 40 pattern shafts. A definite win-win situation! The above theory is extended to the new shafts, and an additional back length extension added due to the increase in shaft. The comber extension is 12” or 30 cm. 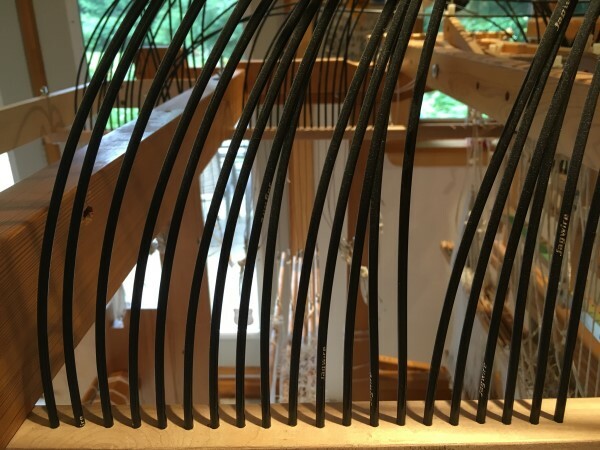 Image: The extra 20 shaft comber board extends behind the back of the loom. You can see the new original twenty in front (top right hand side). 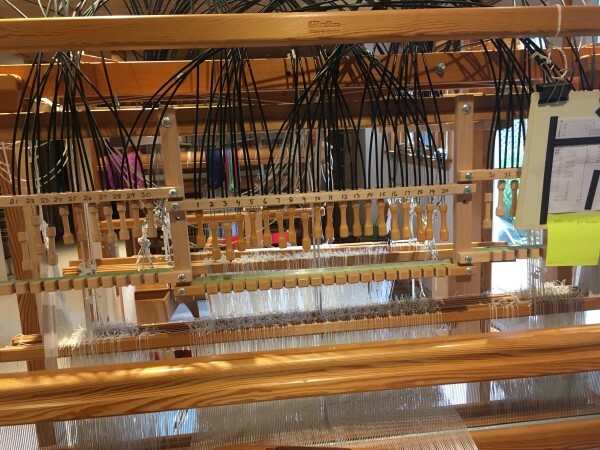 As there are now an additional twenty shafts, the back of the loom also needs to be extended. The new back extension is 16.5” or 40 cm, and in our case, collapsible. Image: This is the collapsible back extension. When only 20 shafts are required this can be removed and the back beam re-positioned in its original spot. This conserves floor space. Image: The end result: 50 shafts all lifting easily, smoothly, evenly and horizontally.